This report examines the drivers – like granting remote access to family or Airbnb guests – and barriers to adoption – like cybersecurity concerns – of the smart door locks market. Sponsored by ASSA ABLOY, The Smart Door Locks Report is based on a survey of hundreds of consumers around EMEA. Get to grips with the latest innovations driving the development of the security industry, and boost your professional development at the same time with this CPD-accredited programme. Join IFSEC Global at IFSEC 2019 in London this June. IFSEC’s education partner Tavcom will bring a range of experts together to take on the ‘smart’ future at the Future of Security Theatre. Exclusive download: The smart door locks report This report examines the drivers – like granting remote access to family or Airbnb guests – and barriers to adoption – like cybersecurity concerns – of the smart door locks market. 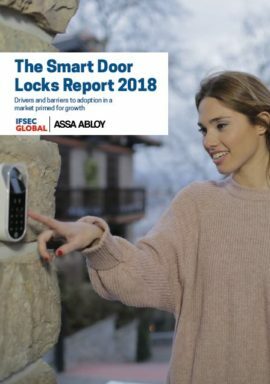 Sponsored by ASSA ABLOY, The Smart Door Locks Report 2018 is based on a survey of hundreds of consumers around EMEA.